On Saturday April 6, the Pepsi Center in Denver Colorado hosted this defensive battle between the Saskatchewan Rush (8-6) and the Colorado Mammoth (6-9). It was LaCrosse Out Cancer Night in Colorado and the Mammoth were hoping to take advantage of the hometown crowd of 12,841 Loud House fans to help them get the “W” and clinch a spot in the postseason. Despite the amazing performance of their starting goaltender Dillion Ward (1A), they were unable to come away with the win. Ward faced 55 shots on goal and only allowed nine to hit net. Adam Shute let in seven goals against for the Rush, seeing only 32 shots on goal, 11 of which came in the first quarter. Colorado’s offensive star Eli McLaughlin (2A) was limited to only two assists. Mark Matthews (2G, 2A) was able to score twice and help out on two giving him the first “Star of the game”. The Rush were able to dominate on loose balls beating the Mammoth 79-57. Final Score: Saskatchewan 9—Colorado 7. Saskatchewan’s defense was able to contain the Mammoth offense in the first, keeping them wide and after the first couple minutes, Colorado was unable to get inside for good looks. On the other end of the spectrum, the Rush were unable to score because of solid goaltending from Ward. The first goal of the night and only one in the first came seven minutes into the game. Jeff Shattler (1G, 2A) received a pass from Ben McIntosh (1G, 2A) as he was cutting through the middle. Shattler caught the ball with a defender right on him but was able to catch and shoot scoring short side. Saskatchewan led 1-0 after the first 15 minutes of play. The second quarter had a little bit more action with the Rush scoring the first two. Ryan Keenan (2G) would start it off as he would find the net on his wrong side of the floor scoring over the left shoulder of Ward on a fast break opportunity. Robert Church (2G) kept the run going for Rush as he came around a high pick at the point and brought the ball back scoring short side low on a far outside shot. The Mammoth would finally get one 8:50 into the second. This goal would be awarded to Chris Wardle (1G) after a missed shot from Ryan Lee (3A) would bounce off the boards and hit Wardle’s stick to trickle in past Shute. After a fast break opportunity did not work out for the Rush, McIntosh capitalized when Mammoth attacker Kyle Killen (1G, 1A) got stuck playing defense. McIntosh scored in the top right corner shooting around Killen. Score at the end of two: Rush 4—Mammoth 1. Matthews would get the first goal of the second half for Saskatchewan after he missed the net he was able to grab his own rebound right in front of the crease and dove faking short side, scoring far side. Mammoth forward Jeff Wittig (2G) would get in the action when he grabbed a rebound off of a shot from McLaughlin that missed the net, he would roll past his defender scoring high. The Rush challenged the goal but the call on the floor stood and the Mammoth would get their second of the night. A breakaway opportunity for Mammoth defenseman Julian Garritano (1G) giving him his first career NLL goal with the assist going to Ward. A push on the back from Jeremy Thompson (12-18 FO) sent Garritano into Schute but there was no crease call and since the Rush had used up their challenge flags the goal stood. Matthews would close out the quarter for his second on the night with an outside shot and using his height he would sh0ot over multiple players catching Ward off guard. The Rush would hold the lead 6-3 at the end of three. With 15 minutes left on the ticker, Scott Campbell (1G, 1A) would get one more for the Rush running through the middle and ended up on the wrong side of the floor but had enough space to fake out Ward. Killen would get his first and only goal of the night on the wrong side of the floor when he beat his defender down the alley scoring over the left shoulder of Shute. Wittig would get his second diving across the crease also beating his defender down the alley. Saskatchewan would match two for two, the first as McIntosh would drive to the net causing two defenders to commit, allowing him to find Church wide open for an outside shot; and the second when Keenan scored utilizing the swim move to get past his defender scoring five-hole on the crease. The Mammoth would notch another two, both from Cory Vitarelli (2G, 1A) the first on the power-play and the second with the extra attacker, but it would not be enough. The Mammoths late-game push was stopped short off a holding penalty by Tim Edwards. Final Score: Saskatchewan 9—Colorado 7. The Colorado Mammoth (6-9) will play their final home game of the 2018-2019 against the Rochester Knighthawks (4-11) on Friday April 12, game time 9:00 p.m. EST. 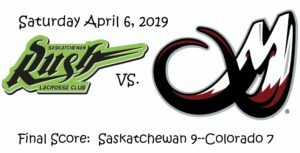 Saskatchewan (8-6) has a double-header weekend in store. On Friday April 12, they head down to San Diego to play the Seals (9-6), game time 10:00 p.m. EST; and they head home on Saturday April 13 to host the Philadelphia Wings (3-12), game time 9:30 p.m. EST.